The Union Minister of State (Independent Charge) for Development of North Eastern Region (DoNER), MoS PMO, Personnel, Public Grievances, Pensions, Atomic Energy and Space, Dr. Jitendra Singh has appealed to various ministries in the Central Government as well as the State Governments to cooperate in carrying forward the Department of Personnel & Training(DoPT)’s innovative reform to switch over to the use of “one-page" form or format to apply for jobs, issue of birth and death certificates and availing of various Government schemes. 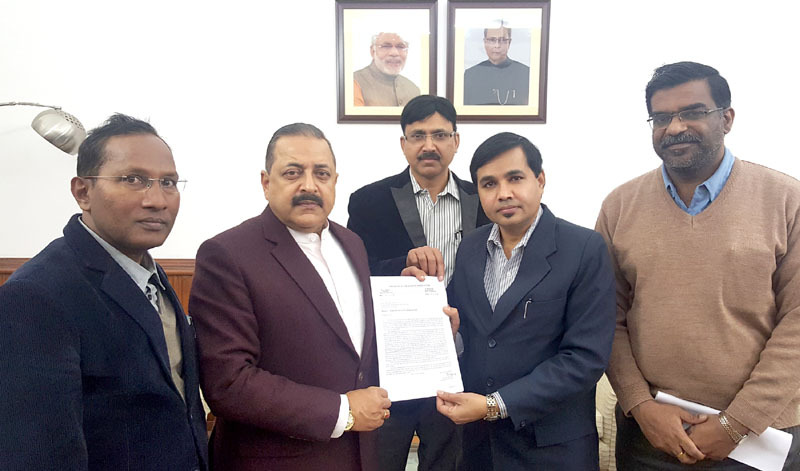 A delegation of Indian Telecom Service (ITS) Association called on the Union Minister of State (Independent Charge) for Development of North Eastern Region (DoNER), MoS PMO, Personnel, Public Grievances, Pensions, Atomic Energy and Space, Dr Jitendra Singh here today. The delegation was led by its General Secretary R. Saji Kumar. The delegation sought Dr Jitendra Singh’s intervention for cadre review of the ITS officers. The delegation also submitted a memorandum to Dr Jitendra Singh wherein it was stated that Indian Telecom Service is a Group-A service with around 1700 officers posted in various wings of the Department of Telecom including DoT, MTNL, BSNL, DVNL, Central and State Government Departments and PSUs. The memorandum claimed that the previous cadre review had taken place more than 25 years ago and the ITS cadre strength as on 1st January 2008 is more than 6000. However, in view of the vast implementation of Government’s plans like the Prime Minister’s flagship programme “Digital India”, communication related networks of DoT, including policy making, licensing, regulation, network security, enforcement skill building, “Bharat Net” etc., a requirement of minimum 1100 ITS officers has been sent to DoPT for its consideration. The memorandum also pointed out that the Ministry of Communication & IT has approved additional requirement of about 800 ITS officers in BSNL, MTNL as part of ITS cadre review. The delegation submitted that there is heavy stagnation in the cadre and no promotions have taken place in the last 5 years. A judicious cadre review will therefore not only meet the functional requirement of the services, but will also address the career aspirations of the ITS officers. Requesting for sympathetic view, the officers said that redressal of grievances of the officers will also help improve the services in communications sector. Dr Jitendra Singh assured that the DoPT will do whatever possible to address the issues put forward by the ITS officers.